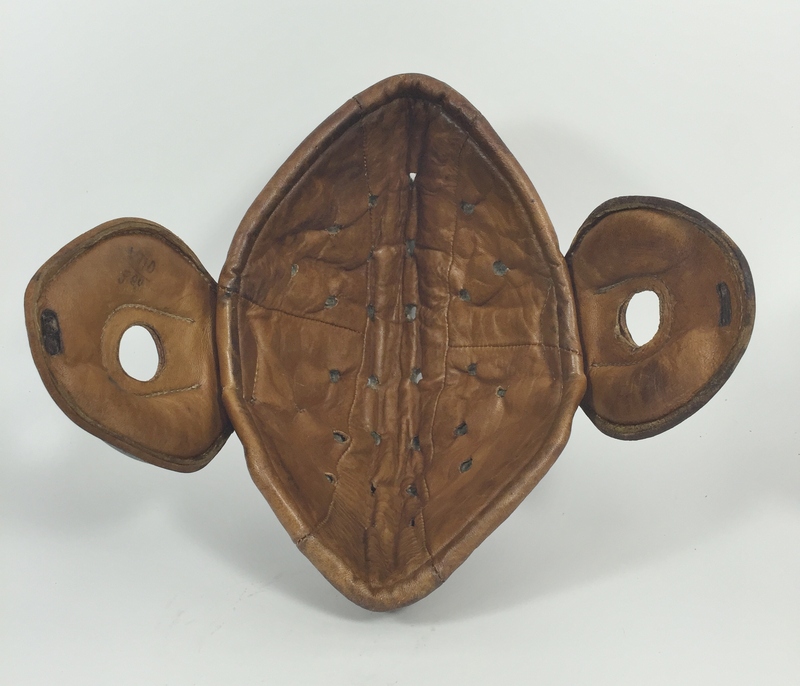 Our December 2015 Artifact of the Month is an outstanding example of an all-leather molded crown head harness. The term "raincap" is a modern description for a style of football head harness popular between 1905 and 1925. 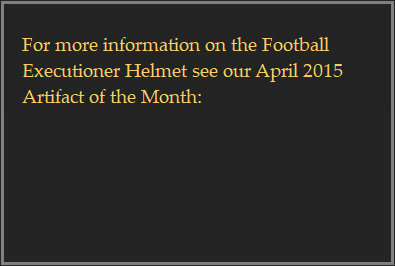 During this period, most helmets were given model numbers or letters rather than descriptive names (i.e. Reach Head Helmet No. 5). Raincaps were introduced after the Intercollegiate Football Association, out of concern for the increase in player injuries, banned the use sole leather in football equipment. Raincaps are best described as soft, form-fitting head coverings similar to padded skull caps with ear flaps. Because they were easily folded many surviving examples have permanent deformations caused by decades of unsupported storage. 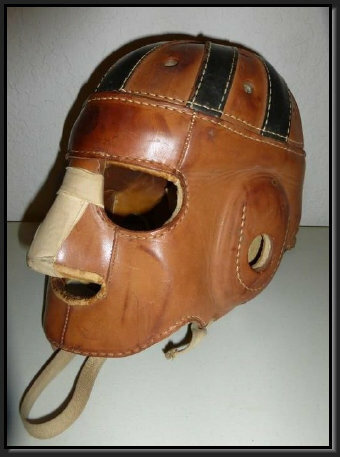 Raincaps were manufactured out of canvas, moleskin, and leather by nearly every football equipment manufacturer of this period. 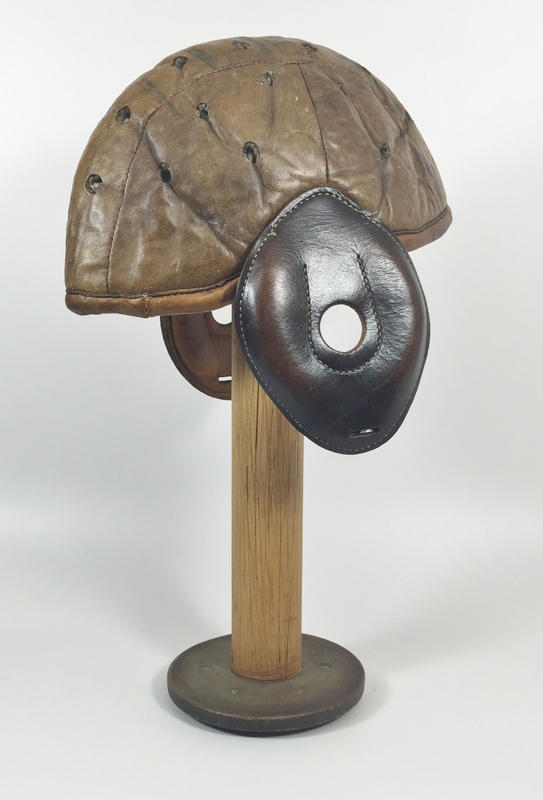 The lack of a well-defined neck protector on this example likely dates it to the earlier portion of the raincap period, 1910-1915. It also possesses a rare leather interior, whereas most examples utilized wool or cotton padding on the inside. The striking two-tone appearance of the head harness is the result of the use of a stiffer grade of leather for the ear pads. The helmet is in near mint condition, with the exception of a missing chin strap. 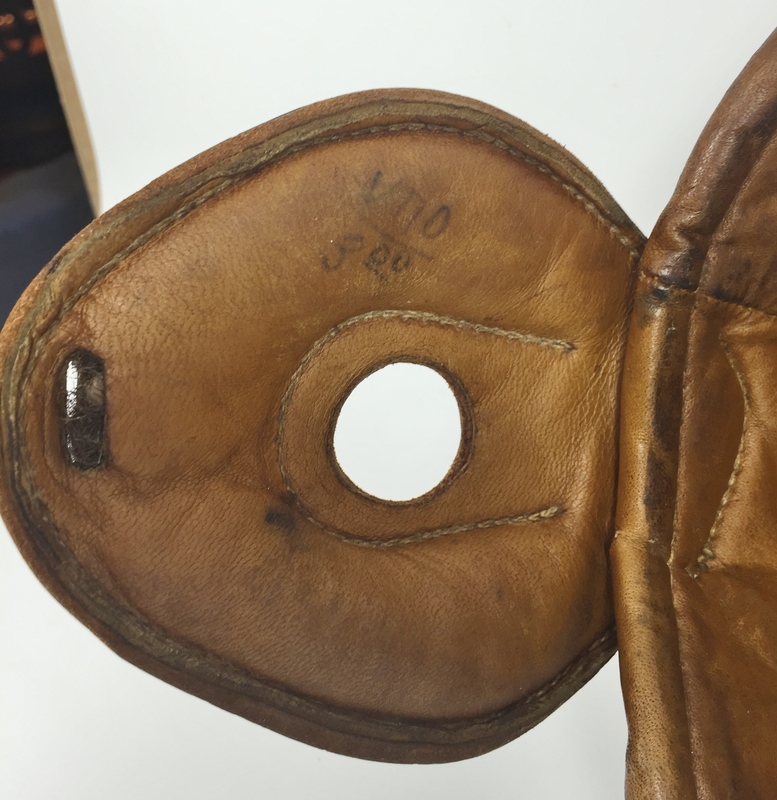 In fact, the original price of the head harness, $3.00, and "1910" are still clearly visible on the inside of an ear pad. No manufacturers stamp or tag is present.